Quantitative Literacy (QL) builds on Algebra I to explore mathematical topics and relationships. Emphasis will be placed on applying modeling as the process of choosing and using appropriate mathematics and statistics to analyze, to better understand, and to improve mathematical understanding in real world situations. Students will represent and process their reasoning and conclusions numerically, graphically, symbolically, and verbally. Quantitative Literacy will help students develop conceptual understanding by supporting them in making connections between concepts and applying previously learned material to new contexts. Students will be expected to use technology, including graphing calculators, computers, or data gathering tools throughout the course. QL is going to be very different from other math classes. Because this class is geared more toward learning about the real life applications of math, we take a very different approach to learning. We will still have vocabulary, homework, classwork, and the occasional quiz, but we will have NO TESTS! Instead of tests, there will be a large presentation every quarter in which each student will have to stand and present (yes, in front of the whole class period) their findings from the quarter. Each quarter will build from the last and in the final quarter, we will tie together everything from the year. 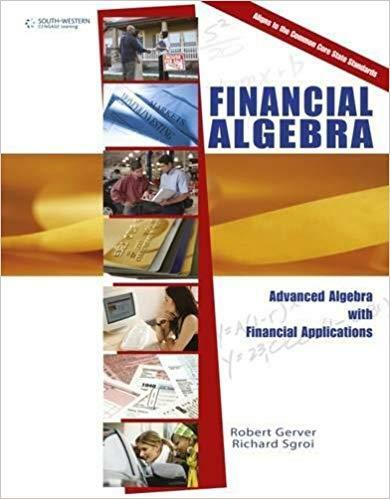 The book we use for QL,Cengage Learning’s Financial Algebra (Gerver & Sgroi), is pictured below. We only have a classroom set of these books, so the students will not have a book to take home. When there is homework, a paper-based assignment will come home with the student, on which all necessary information can be found; in other words, the student will not need to bring a book home.